After adding a domain, you will be taken to the form to add keywords. On that page, you can enter as many keywords you want depending on your plan. You'll be charged based on the number of keyword units used (definition below). What is a Keyword Unit? In SEO Suite, a keyword unit is the product of the number of keywords and the number of search engines chosen. 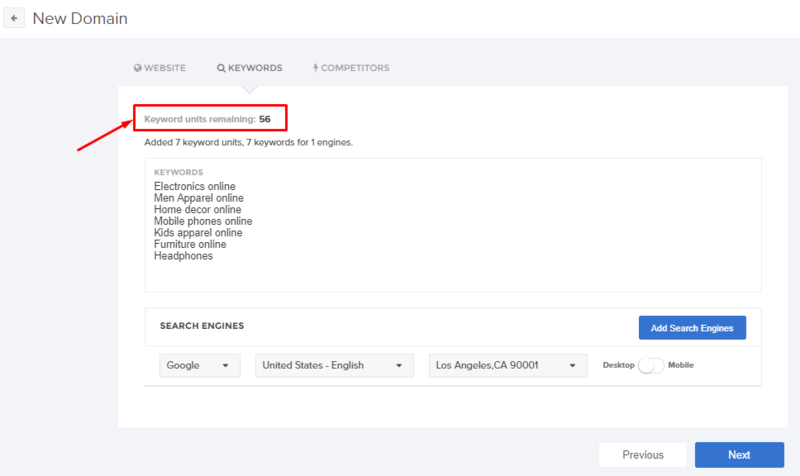 When you add keywords, it typically takes 60 minutes or less for ranking data to start showing but may take up to 24 hours for all keywords to be processed and populated. You can continue to add keywords and domains as needed and those will all be queued up for data.